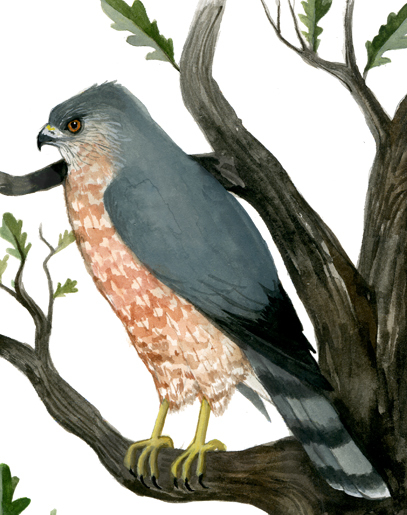 Rendering of a Cooper's Hawk, otherwise known as a Chicken Hawk, by Chicago artist Diana Sudyka. Cooper's Hawks look very similar to Sharp-shinned Hawks, but differences can be detected with key details like tail feather shape. Our field guide gives more clues for distinguishing the species. This story about hawks was a long time coing for Carole Zemont of Chicago’s Norwood Park neighborhood. Carole thinks she’s “genetically predisposed” to be interested in birds, after growing up watching them at the bird feeder her mother put up in their backyard. Is anybody studying the increasing hawk activity in Chicago’s neighborhoods? Her question covers several topics, including the people on the lookout for hawks, but we thought we owed it to Carole to suss out whether — in fact — there’s a local population of hawks on the rise. While tracking this down, we came across a bit of a wildlife conservation success story. Observant bird-watchers like Carole suspect there are more hawks in the area, but have professional researchers taken note, too? Well, there are several local researchers who study and document the goings-on of wild critters in our urban and suburban environment, but when it comes to studying hawks specifically, we can turn up only one: Mason Fidino of the Urban Wildlife Institute. Founded in 2009, the Institute’s part of Chicago’s Lincoln Park Zoo. These birds were once widely viewed as a menace and even hunted in the past. Nicknamed “chicken hawks,” they were despised as chicken thieves. Later, the pesticide DDT also damaged their population. Cooper’s Hawks mostly eat other birds, so they would have ingested all of the DDT concentrated in their prey animals. The pesticide caused eggshells to thin, and they would crack under the weight of the large birds. The Cooper’s Hawk was even on Illinois’ endangered species list from 1977 through 1997. Eventually, human interference loosened: We stopped shooting “chicken hawks,” we banned DDT, and, according to Fidino, the hawks came back. How easy is it to see one? Fidino says he sometimes even sees hawks hunting in Chicago’s Lincoln Park. If you see something quickly zooming towards the ground, it could be a hawk looking for lunch. For his part, Fidino will see the hunting bird just out of the corner of his eye. It will be “this really quick movement going from the top of the tree downwards to whatever it’s trying to catch. Then its talons go out, and it grabs what it’s going after and then it’ll swing back up or land with it,” he says. Cooper’s Hawks have nests that are smaller than squirrels’ bulky, leafy nests. Another way to catch a glimpse of a hawk is to keep an eye on their nest “and see who shows up,” Fidino says. It’s reassuring to see a previously struggling species thrive, but perhaps you’re wondering about a downside. 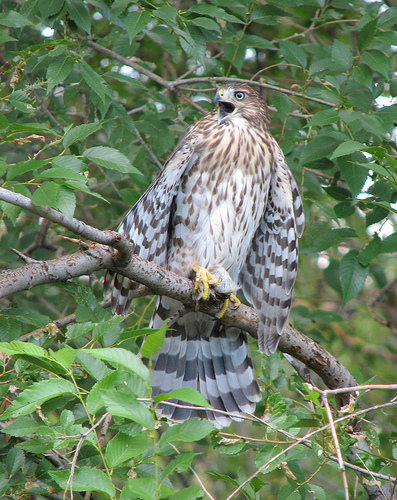 Cooper’s Hawks survive mostly by hunting smaller birds. Will we be hearing about a “save the chickadees” campaign in a few years? Hawks mostly hunt birds, although they’ll also dine on small mammals. It’s very rare for pets to come under attack by raptors. However, when pressed, Fidino will advise that owners of small pets might want to “be mindful of the species that they’re adding to the ecosystem,” and perhaps not leave especially tiny dogs unattended in the back yard. Carole wondered if we’re seeing more hawks in Chicago because they’ve developed adaptive behaviors to live in cities. Dr. Seth Magle, the Urban Wildlife Institute’s director, says that’s not the case. He described the concept of “habitat analogs,” where parts of our built environment function to animals the way their natural habitat does. Magle provides the example of pigeons. “They’re cliff-dwelling species, but in cities we build these big tall buildings, so to pigeons they may kind of look like cliffs,” and thus look like home, he says. Hawk behavior is similar. Red-tailed hawks like to perch on something tall, and power lines along the highway function perfectly for that task. Other species, including the Cooper’s Hawk, feel perfectly at home in trees near humans. And why not, now that we city-dwellers and suburbanites are more interested in watching hawks than shooting them. Special thanks to the Cornell Lab of Ornithology for permission to use images, bird listings and sound for this story. Katie Klocksin is an independent producer. Follow her on Twitter at @KatieKlocksin.